If you visit Zooniverse Home today you may notice that a few things have changed. 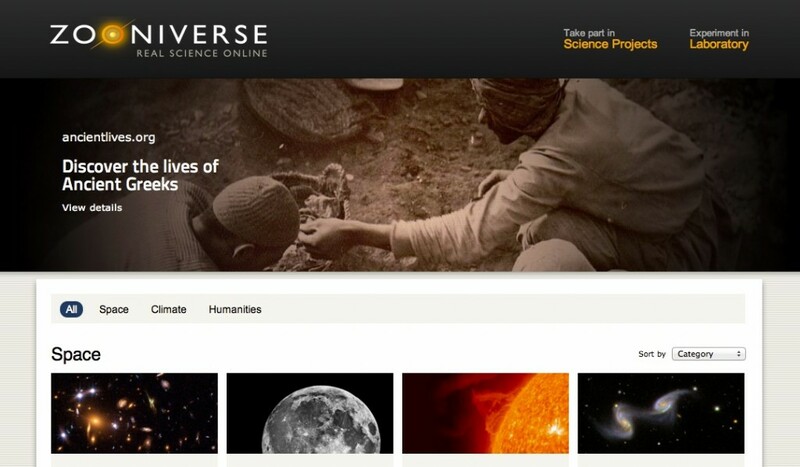 For a while now we’ve wanted to improve the design of the site to better handle the growing range of projects that are part of the Zooniverse. With the updates released today we’ve completely reworked the look and feel of the site. We’ve organised projects into different categories, starting with Space, Climate and Humanities. There are lots of new categories coming soon. Today we’re also launching an entirely new type of project as part of ‘Zooniverse Labs’. To date all Zooniverse projects come with the guarantee that your work will contribute directly toward real research output (usually academic papers), however this can make it hard to try new ideas. As the name suggests, Zooniverse Labs is about experimentation and we’re excited about launching new, often smaller-scale websites that continue to stretch the boundaries of science online. More news on this very soon. Another new part of the redesigned Zooniverse homepage is the ‘My Projects’ section that allows you to see your contributions to the Zooniverse, and what else you might like to try out. This part of the site is very much in beta, and we hope to add to it in the coming months. We hope you like the new look, and that it helps you explore more of what the Zooniverse has to offer. It’s great; I love it! One things I noticed, though, is that the sorting of the projects by launch date is a little off (Ancient Lives is behind Ice Hunters).